Meredith is trying SO hard, and with lots and lots of practice, is slowly learning to self feed. The first couple seconds of this video are where she really shines, haha! Getting Fitted for our Stander! Yesterday morning Greg and I brought Meredith to Children's Hospital to get her fitted for her stander. They drew an outline of her little body on brown paper and then took lots of measurements. Meredith was happy and patient throughout the appointment, which was great because she hadn't been feeling well the last few days thanks to another ear infection - her 5th of the season, ugh. The options they showed us for standers were much simpler models than the one's our PT had shown us. They were compact and transportable, which we liked, but we need to make sure the PT thinks these will be ok for Meredith since they are slightly different. The office agreed to call and talk with Arlene, the PT, to make sure these models will work. But we have the ball rolling! They also took casts of her tiny feet to make the orthotics she will wear while in the stander. We got to pick the pattern we wanted for the AFO's which was actually the hardest part, but after going back and forth for way too long between leopard print and sky, we finally settled on a light blue sky design : ) They said it would be about a month until the stander is ready for us. I cannot wait to see this little girl standing, it's going to be amazing. After Children's, we were off to the pediatrician's office to check in on why her ear infection wasn't getting any better. 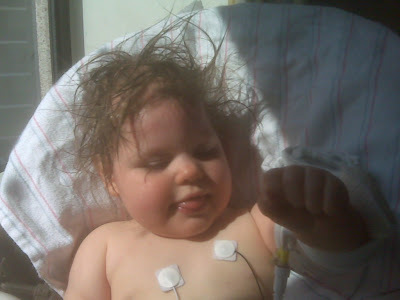 The doctor confirmed that the antibiotic she had been on just wasn't working. They gave her a shot in the leg and already, she's well on her way to recovery. She was much, much happier today and back to her usual smiley self. 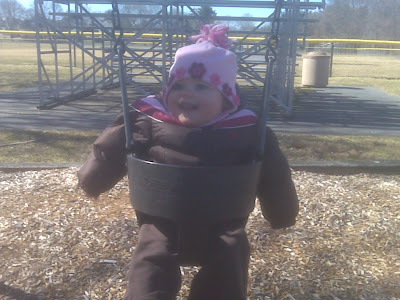 It was so warm out, we went for a nice walk and played for a while on the swings at the park. So nice to see her happy again!